HOTERY PRODUCTS CORP. is a specialized manufacturer in Taiwan. 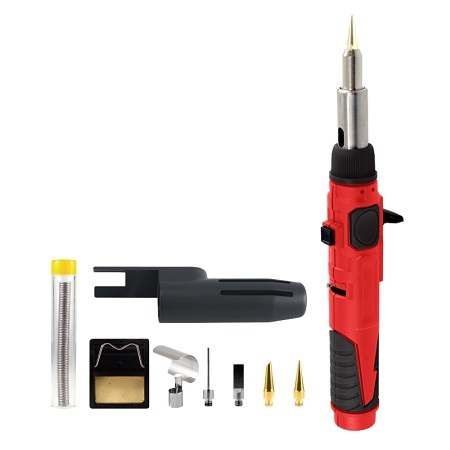 We pretty sure that the high-class equipment, excellent technology management and rich experience in this line will help us guarantee to provide superior quality Butane Soldering Iron Kit, thus able to satisfy customers' changing needs effectively. 1. Compact and Ergonomic design, contemporary two tone colors. 2. Ergonomic handle design with folding stand as an ideal solider iron with 26ml fuel capacity. 3. Piezo push button to ignite it automatically. 4. Adjustable flame lever for ease of use. 5. Ideal pen torch for a wide array of applications with varies tips supplied in a blow molded case packed with a slide-in color sleeve. 6. Temperature – up to 1000℃(torch). 400℃(soldering). 500℃(hot blower).